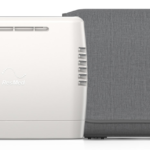 In my last two posts, I discussed the two most important factors in determining which portable oxygen concentrator is the best: oxygen flow and size. A third important consideration is battery power. One of the greatest benefits of portable oxygen concentrators is they are truly portable. With the ability to unplug from an electrical outlet, a portable oxygen concentrator can go anywhere you do. The question is: How long do you want to be fully portable? All portable oxygen concentrators use lithium ion batteries, but they cannot be purchased anywhere. Each portable oxygen concentrator has a battery specifically designed for use with that concentrator only. The batteries range in size and weight from one model to another. And they provide different amounts of power (length of time) from one model to another. In addition, the flow setting (1, 2, 3, etc.) and whether pulse flow or continuous flow is chosen have a great impact on how long the battery will last. The Inogen One G3 has a standard battery that can be changed as needed. In fact, the G3 has two different sized batteries (singe-cell and double-cell) to allow you to option that best suits your needs: smaller weight or longer battery time. The Inogen One G3 single-cell battery provides 3.5 to 4 hours on Setting 2, a little less time on Setting 3, a little more time on Setting 1. The Inogen One G3 double-cell battery provides double the time: 7 to 8 hours on Setting 2. If I get double the time with the double-cell battery, why wouldn’t I chose that one? Good question! The drawback with the double-cell battery is the weight. It adds about another pound to the weight of the unit, so instead of 4.9 pounds, the Inogen G3 would be about 6 pounds. For some people, the added weight is hardly worth a second thought, for others, it is a great consideration. Another portable oxygen concentrator model that offers two different sized batteries is the Inogen One G2. 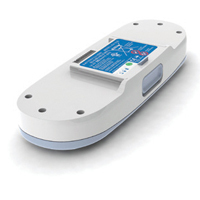 The Inova LifeChoice has an internal battery that lasts 2 hours on all flow settings. If you’re still on-the-go when the battery drains, you will need to use the supplemental battery, which is contained in a battery belt. You wear the battery belt around your waist and plug it into the side of the concentrator. This battery belt will provide an additional 3 hours at all flow settings. The idea behind a battery belt is to keep the added battery weight off the unit itself, where it can be heavy when worn over the shoulder, and place the weight around your waist, where you would be less likely to notice it. Many people love it. Others find it cumbersome while sitting because they cannot be even a few feet from their concentrator because the cord to plug the belt into the unit is very short; and they find it a hassle when it’s time to use the facilities. Others simply don’t like wearing a belt because it conflicts with their fashion preferences. Another portable oxygen concentrator model that offers an internal battery and a supplemental battery belt is the AirSep FreeStyle. Similarly, the Invacare XPO2 has an internal battery and a supplemental battery that attaches to the side of the unit with a velcro. 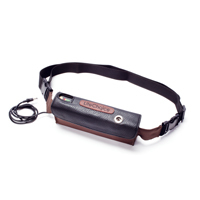 The Respironics SimplyGo has a standard battery that can be changed as needed. Since the SimplyGo offers both pulse and continuous flow options, the battery times are a little be trickier. On pulse flow, the SimplyGo will last 3.5 hours on Setting 2, and gradually less as the flow setting is increased (about 1/2 hour per setting). On continuous flow, the SimplyGo will last 0.7 hours. Not much, huh? Well, the continuous flow setting means the motor has to run much harder and the SimplyGo’s small size and weight, just don’t allow for a larger battery. If you can use the pulse flow setting while you out-and-about, and then switch to continuous flow when you can plug into an electrical outlet, then the SimplyGo is a great unit. 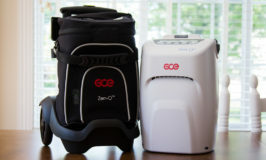 Other portable oxygen concentrator models that have standard batteries that can be changed as needed are the Respironics SimplyGo (pulse flow only); and the SeQual Eclipse 3, DeVilbiss iGo, Oxlife Independence, Invacare Solo2 (pulse and continuous flow). The style, weight, and power time vary greatly from one model portable oxygen concentrator to another. Which is best? Only you can decide based on your oxygen needs, but I hope to have given you the information you need to make that decision. I’m considering the Inogen One G-3. My concern is I have very narrow shoulders & am not sure it would be easy for me to carry. The G3 comes in a carry bag with a long shoulder strap. For narrow shoulders, you would want to carry it cross-body; otherwise, your concern is valid, as it would easily slip off your shoulder. Given what these portable machines cost, I’m concerned with longevity. Any idea how long they last? For what they cost the machine life should be many years! Portable oxygen concentrators typically come with a 3-year manufacturer’s warranty. With proper care, and possibly repairs during and after the warranty period, a portable oxygen concentrator should last at least five years. Often, once the unit is out of warranty, the cost for repairs is prohibitive and technology has advanced such that many people choose to purchase a new (often smaller and lighter) unit. I’ve heard that the battery-with-belt models require the user to switch before the battery runs down, because the belt battery hasn’t sufficient power to restart the concentrator. That sounds like a huge drawback — comments? Correct, the AirSep FreeStyle battery belt does not have sufficient power to restart the unit when the internal battery has fully depleted. However, I have not heard this being much of a drawback. The unit has a low battery alarm that will indicate when the battery belt (or other power source) must be used. Once the battery belt is connected, the unit will continue to use up the internal battery before switching to the power of the battery belt. Which of the continuous flow concentrators offers the longest battery life? 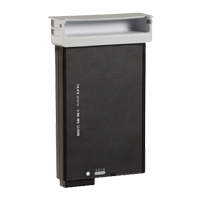 The new SeQual eQuinox 24-cell battery offers the longest battery life, followed by the DeVilbiss iGo, SeQual Eclipse 5, and Invacare Solo2. A quick glance at comparison charts shows the Oxlife Independence having the longest battery life; however, the Oxlife batteries are smaller and the unit hold two batteries. The two batteries combined have the longest life when compared to the single batteries of other units. Are there restrictions or other difficulties in using the portable concentrators as an airline passenger? 2. You must have sufficient battery power to last 150% of the duration of the flight. Even if you only plan to use a little oxygen, airlines plan for a worst case scenario and require you to be self-sufficient. 3. You must have a Physician’s Statement in your possession. This is a standardized from letter that can be found on the websites of most major airlines. This form states the concentrator you are using and your required oxygen flow setting, and must be signed by your doctor. Your website has been incredibly helpful–it is hard to find good info on POCs. Currently I have an Airsep freestyle 5. I use it on setting 3 when I am standing or moving and turn it off when I sit to save battery life. I am a doctor in an office practice. My day consists of going between my office and patients rooms, sitting for a bit, standing for a couple of minutes, then going to another room or office, repeatedly. Even with turning it off when I can, I’m usually out of battery by 2 pm. Having additional external batteries hasn’t helped because the internal battery is still used and dies. I try to charge in my office when I can, but when the unit is hot (it gets very hot just with use) it can take up to 30 minutes to start charging. I think I need something with truly exchangeable batteries to be able to work longer (and also get to work, get home, do things before/after work, etc) so I can use one while charging the other. It looks like the G3 might be very good for my needs, although the every 15 second noise is somewhat concerning. Are there other machines that have only external, swappable batteries that might help? Yes, the Inogen One G3 would certainly be a good solution to the battery issue you are having. The newest version of the Inogen One G3, the model that goes up to setting 5, is a bit quieter than the original G3 that had the loud purging noise. Another option that has a much quieter purge is the Philips SimplyGo Mini. I have a love to go O2 concentrater it has given me more freedom both in the car and at home the downfall is the batteries at 3/4 ltrs p.m. I am lucky to get I/2 her. I am not familiar with the Love to Go POC so, unfortunately, I cannot help you with information about battery times. Do you have the name of the POC correct? Yes, lithium ion batteries do wear out over time, usually when they are around 3 years old. Unfortunately, you’ll have to purchase a new battery as they cannot be repaired.